Anyone who’s building a custom home knows that landscaping plays a big role in achieving the vibe you’re going for. It’s the first thing you see when you walk by, and it sets the tone for what’s inside. Even if you don’t have much space up front, you can take your designs to your backyard. It’s a great way to extend your home — keeping up with the indoor-outdoor trend. Regardless of where your free outdoor area is, landscaping will make that space more personal and fitting to your needs, preferences, and location. A lot of homeowners really take the time to decide on what their lawn or backyard would look like. Some even hire professional landscape artists to bring their vision to life. Whether you want professional help or you’d rather DIY the whole thing, here are some landscaping ideas we’ve seen for custom homes in Florida. Color your garden with flowers. Nothing says Florida like the vibrancy and color of flowers. They keep your home bright, beautiful and inviting. There are so many to choose from that you can keep with whatever palette you already picked for your home and mirror or complement it in your garden. If you have a small garden, the trick is to build a smaller fence and adorn the space with flowers. This makes your garden look bigger and your home looks further from the street. You can even add some vines for that lived in, cottage look. There’s a modern take on the “white picket fence”. Taking inspiration from your location is just as important in landscaping as it is in interior design. Because you have to maintain this garden, research which plant will last in the Florida weather. You can either pick plants that are native or those that thrive in a similar climate, such as African Lilies, Spanish Bayonet, Jacobinia and Needle Palms. By picking the right plants to decorate your garden or backyard with, you’re spending less on changing them out every season. It also makes them look more organic in the terrain. How grand the water feature is does not matter. 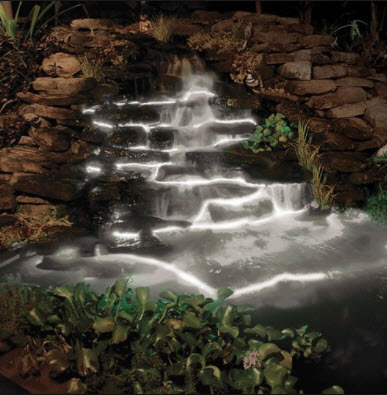 Whether you DIY a pot and turn into a fountain or get a pond made in your yard, what’s important is that you’re adding a dramatic touch and a relaxing fixture in your outdoor area. It’s a great conversation piece that keeps the area looking serene and put together. You can even add fairy lights at night to highlight it. We hope you enjoyed these landscaping ideas! Which one was your favorite? Let us know in the comments below!